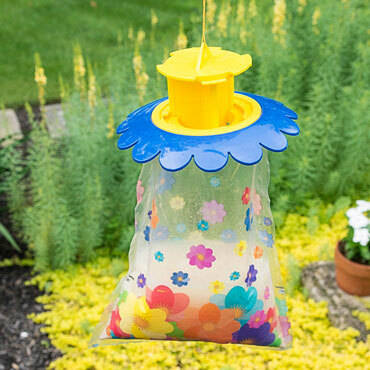 Our Outdoor Disposable Fly Trap is a simple, no-mess way to keep flies from taking over your patio and garden. Our experts have extensively tested this patented fly trap in our research garden, where it's proven to be more effective than other traps on the market. Specially formulated bait is contained in a water soluble pouch inside the trap, and has been shown to work on blow flies, carrion flies, blue-bottles, green-bottles, cluster flies, flesh flies, house flies, stable flies and more. There's no need to touch the bait--simply add water and it's ready to go. When the trap is full, simply twist the lid to close and discard. The bait is powerful enough to draw flies more than 30-40 ft. away, and will last for 3 weeks. For outdoor use only.